WD 2 16297630 https://www.kaercher.com/uk/home-garden/wet-and-dry-vacuum-cleaners/wd-2-16297630.html Robust, compact and powerful; these are just a few words to describe Kärcher’s WD 2 vacuum cleaner. From unblocking sinks to picking up dirt, the WD 2 can be used throughout the home. With an impact-resistant 12 litre plastic container, specially designed cartridge filter and Pull & Push locking system, you can be sure that the Kärcher WD 2 will be one of the most versatile household devices you’ll own. With practical cable and accessory storage on board, every nook and cranny will be clean thanks to the WD 2 and its innovative crevice tool accessory. All Kärcher products are innovatively designed with practicality in mind: our aim is to save you time and energy when maintaining your home, car or garden. With Kärcher, you’ll be able to clear your entrance area, car interiors and even small amounts of water with the same device, all without having to change filters or mess around with complicated settings. 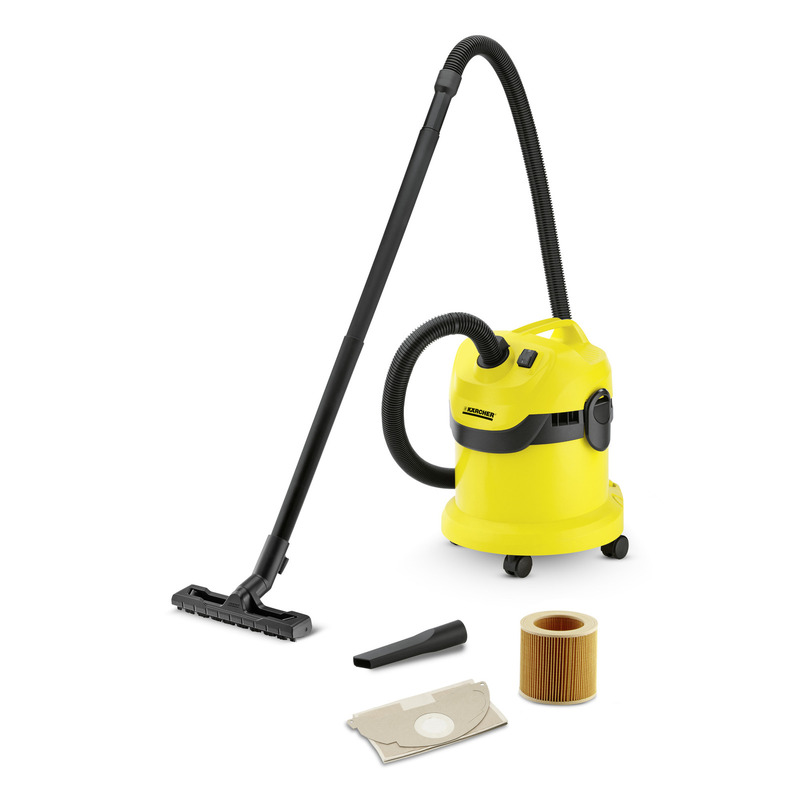 Ergonomically designed with your comfort in mind, the WD 2 is easy to transport and store, and comes equipped with a 1.9m suction hose, two suction tubes, a cartridge filter and a wet to dry floor tool. All accessories can be stored safely on the machine, meaning you won’t have to compromise on storage in order to achieve the best results. WD 2 is rated 3.9 out of 5 by 30. Rated 4 out of 5 by Spotty Dog from Good suction, good price. Excellent vacuum for clearing up after the workmen ! Tackles sawdust, plaster and fine dust with no issues. Had to buy this as I had ruined the filter in my bagless vacuum trying to clean up plaster dust . Although I try to be careful when using it, it still does occasionally fall over when in use, as the hose connects at the top. Rated 4 out of 5 by Curlywurly D from Brilliant, but... Bought recently on recommendation, excellent suction and power, really pleased with it. I've just hoovered my car and it picked up all the small stones with no problems at all. Indoors, I tend to carry it with one hand and hoover with the other to avoid pulling it by the hose and it falling over. Only minus point is the very short power cable, so there's a lot of plugging and unplugging. If it had a longer cable it would be perfect. Rated 5 out of 5 by smiffy from excellent light to use and efficient. Absolutely perfect and a very good price. Rated 5 out of 5 by Saan from Solid, reliable even for simple domestic use This is the second WD2 that I bought. The first was in 2016 from Homebase and I loaned it to a friend who loved it so much that he never gave it back. This is the best all rounder for the home and keeps me from buying 2 other machines. Rated 4 out of 5 by Willywesty from Excellent Pros Good powerful suction. Easy to empty. Would buy again. This was recommended to me by my builder so bought one 12 months ago. Found it lightweight, easy moving. Hardly use my £300 Dyson now as so heavy. Cons Yes can fall over occasionally this is partly due to the short length of plug cable which could be longer. Rated 4 out of 5 by Derek64 from WD2 good basic wet/dry unit Good powerful versatile unit. Recommend using paper bags if hoovering up fine dust. Normal hoovering and water cleaning up is good.